iTunes Store will sell ENTIRE EMI CATALOG DRM-free!!11!1ONE! Hallelujah! Apple and EMI just announced that they will be selling DRM-free Apple songs through the iTunes Music Store. The songs will cost 130 percent of the price of the existing crippled songs, and you'll get to choose. Weirdly, Apple seems to have sold this move to EMI by saying that the DRM-free version will be a "premium" offering for audiophiles who want higher-quality music. I think that audiophiles are probably the people who have the least trouble keeping up with the latest tips for efficiently ripping the DRM off of their music -- the people who really need DRM-free music are the punters who can't even spell DRM. This is some of the best news I've heard all year. DefectiveByDesign is soliciting ideas for a thank-you gift to Steve Jobs. This may just be a sneaky way of hiking music prices, but hell, it's a whole lot more than I thought we'd get. What's more, Apple pricing DRM-free music at $1.29 means that the $0.79-0.99 DRM-free MP3s from competing indie music stores will get a huge price advantage. I could not be happier right now. I really hope Apple decides to make a web-based version of the iTunes store so that I can buy iTunes tracks in the future using Ubuntu Linux (I know, it's been ages and I still haven't written my "switching to Linux" article, it's in the pipe, but here's the story: I switched, it's awesome, I love it). Jobs, who stressed the need for higher-quality music with the rise of high-fidelity home speaker systems, called EMI's move "the next big step forward in the digital-music revolution--the movement to completely interoperable DRM-free music." He added that "Apple will reach out to all the major and independent labels to give them the same opportunity" and suggested that half of iTunes' music tracks will be available in both DRM-loaded and DRM-free form by the end of 2007. 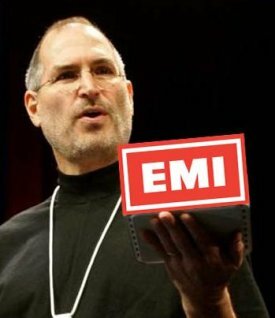 "EMI is pioneering something that I think is going to become very popular," Jobs said when asked if other music labels would likely add DRM-free music to their iTunes catalog. "What we're adding is a choice--a new choice--and people can choose whichever one they want," Jobs said regarding Apple's decision to make available two levels of sound quality and DRM restriction. Nicoli cited internal EMI tests in which higher-quality, DRM-free songs outsold its lower-quality, copy-protected counterparts 10 to 1.
according to EMI's press release." Update 2: Engadget's Ryan Block has a great, skeptical editorial about this announcement, "Apple and EMI ditching DRM is good, but it's not good enough"
But we don't believe having free, usable, uncrippled media is a feature -- it's a right. You don't pay a premium for higher quality DRM-free physical media -- DVD Audio and SACD discs costs the same as CDs (in fact, often times they come as hybrids on the same media). Asking customers to pay 30% more for no DRM and a higher bitrate is a distraction, a parlor trick to take our attention away from the philosophical issue: EMI is still selling DRMed music. EMI CEO Eric Nicoli said, "Not everybody cares about interoperability or sound quality." Since when did the two become so intrinsically linked? Sure, not everyone cares to vote either, that doesn't mean it's a premium privilege. Nicoli also stated EMI has taken the view that it must "trust consumers." It's true, today's announcement shows more trust than they ever displayed before -- but it's still conditional trust. Will Steve Jobs drop iTunes DRM in a heartbeat? Euro-RIAA justifies breaking iTunes, endorses fairy-tale of "open DRM"
France will let MSFT play iTunes - but what about open source players? Hillary "RIAA" Rosen: iPod DRM is cruel and unfriendly! Friday: call RIAA execs and tell them "No DRM!"